For better operation every electronic circuit needs best Power supply source and mostly electronic components are requires Regulated DC power supply and some applications needs Dual power supply source that is Positive (+V), Ground (GND), Negative (-V). This article helps you to built Dual power supply circuit by using step down transformer and linear voltage regulators. All circuit have individual step down transformer and voltage regulators, you may include LED indicator if you need. 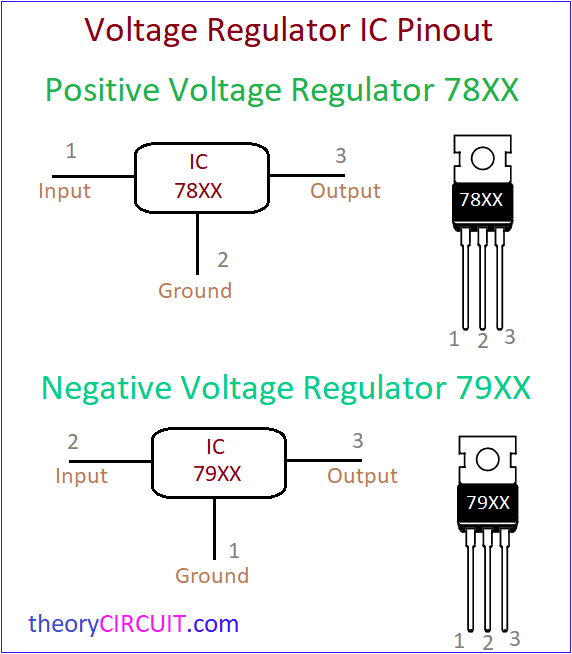 Regulator IC (78XX = Positive), (79XX = Negative) choose voltage range depends on your need. For all above three dual power supply circuit construction and working methods are same but the components specifications only change depends on output voltage range. Step down transformer is reduces the amplitude of input AC 230 volt to 6-0-6 Vac or 15-0-15 Vac or 20-0-20 Vac depends on its specification. Low voltage AC supply from secondary winding of transformer is fed into Bridge Rectifier module (1N4007 X 4), then rectified DC output supply filtered by using filter capacitors C1 and C2, here C1 capacitor in all circuit filters positive side and C2 capacitor in all circuit filters negative side. Voltage Regulator 78XX is responsible to regulate the positive side of DC voltage and 79XX is responsible to regulate the negative side of DC Voltage. Pin configuration of these two voltage regulators are illustrated and the connections are made as mentioned in the pinout. At the output side Capacitors C3, C4 removes any kind of ripples in DC supply and Capacitor C5, C6 removes high freq ripples if any at the positive and negative side of DC output. The common Ground supply derived directly from the center tap of transformer (0) and acts as Ground (GND) terminal for +V and -V DC supply output. Some Audio Amplifiers or Operational Amplifiers and Power amplifiers are requires these kind of dual power supply. For low voltage DC motor Direction control we can use these dual power supply circuit. Choose the Transformer and Diode current rate depends on your need.